Welcome to Saganami Island. . . .
They’ve asked me to introduce all 280,000 words of The Shadow of Saganami to you in five hundred words or less. For somebody who writes books this long, that’s not exactly an easy assignment! Essentially, Shadow is the first book in the “Saganami Island series,” a new series of novels set in the Honor Harrington universe. The focus of the novels will be not on Honor, but on other officers serving in her Navy, many of whom will be recent graduates of the Royal Manticoran Navy’s Academy on Saganami Island. Honor will make only occasional cameo appearances in the Saganami Island books, but her influence will be pervasive, since many of the junior officers in the books will have been her students at the Academy, and some of the more senior officers will have served under her previously. 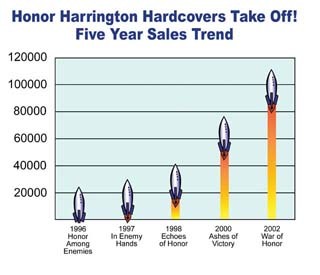 I believe that one of the strengths of the Honor Harrington series to date has been that although Honor is clearly the central figure, she doesn’t accomplish everything by herself. Her successes, more often than not, depend on her ability to lead competent men and women and to inspire them to give of their best. But where do those competent men and women come from? That’s one of the questions the Saganami Island books will explore. This series will also allow me to work with a greater number of junior officers. Honor, because of her successes and demonstrated ability, has been promoted to extremely high rank. As such, her opportunities for individual acts of daring and initiative have diminished. The officers and enlisted personnel in the Saganami Island books, because of their more junior ranks, will have greater scope for personal growth and greater opportunity to demonstrate their individual capability. And as they become steadily more senior, they will become part of the weapon lying ready to the hand of Honor Harrington. In addition, the Saganami Island series, in conjunction with the Crown of Slaves series I’m concurrently working on with Eric Flint, will allow me to more fully develop the entire universe of Honor Harrington. It will move the edges of the canvas back without requiring the development of all the details in the central series of books about Honor herself. I’m currently envisioning at least five or six novels in each of the Saganami Island and Crown of Slaves series, in addition to the central Honor Harrington novels. That number could increase, depending on how the interwoven storylines develop; on the basis of my track record to date, I do not expect it to decrease. The Honor Harrington books have always been a blend of action and politics in a thoroughly developed literary universe which is also (I hope) the home of characters about whom readers care. I think you’ll find that The Shadow of Saganami is just that.